For a long time now, article marketing has been useful in helping people drive lots of traffic to their websites. Unfortunately, many people do not think they can write very good article pieces and as a result, most of them give up. Article marketing can be hectic in the sense that you have to consistently write articles to meet the demands that are needed by those who may need your information. 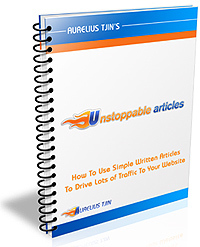 Let this special PDF report show you how you too can profit from article marketing! Valued at $27.00 but our cost is just $1.00!